Fukuda Denshi provides the healthcare industry with a wide line of ultrasound diagnostic systems. They are an emerging global leader that uses the latest technologies when developing their ultrasound systems. They offer a product line that offers both portable systems as well as full size systems that meet your needs and expectations. They create their systems with one purpose in mind. Fakuda Denshi wants you to get you the information you need easily, clearly, quickly and reliably. The company was originally founded by MR. Takashi Fakuda more than 65 years ago. He started the company because he believed that improved medical technology could result in improved care for patients. Fakuda Denshi now connects its technology to patient care in hospitals both small and large all around the world. The company is delivering high performance and reliable functionality at affordable costs. Fukudu Denshi uses advanced functions with their ultrasound systems to allow their users to experience a high quality imaging environment that they deserve. 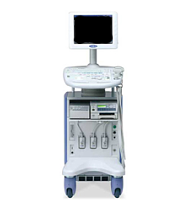 Fukudi Denshi carries some of the top line ultrasound systems that are used in hospitals and clinics around the globe. Some of their systems include the UF-850XTD, FFsonic UF-5800A, FFsonic UF-4100, FFcardio UF-750XT, FFcardio FCU-2000, CFsonic UF-7700 and more. In addition to the ultrasound systems mentioned, they also market a line of innovative ECG solutions to the physicians and hospitals internationally. The CFsonic UF-700 ultrasound machine by Fukuda Denshi is a high end ultrasound system that comes with a variety of user friendly and advanced features. 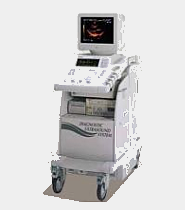 This ultrasound system will provide you with high resolution images as well as enhanced Doppler information. 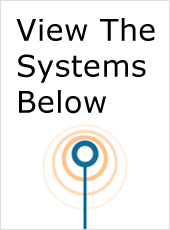 This system is very convenient to use which will result in more workflow for your office. The FFcardio FCU-2000 ultrasound machine by Fukuda Denshi is a compact and portable ultrasound scanner that has a built in electrocardiograph. It has a combination unit that allows easy dual diagnostic testing for patients in all types of environments. To make use of this system more convenient, it has been equipped with a large monitor and a printer that will give you accurate results. 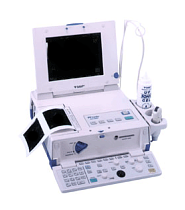 The UF-750XT ultrasound machine by Fukuda Denshi is a light weight and portable ultrasound system. This system will give you high performance which can be used in any setting at anytime. It is equipped with an imaging system that is fully controlled by software to allow for easy and accurate use. 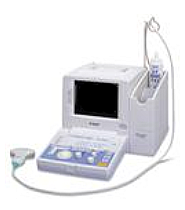 The UF-4100 ultrasound machine by Fukuda Denshi is a portable and multi-purpose ultrasound system. It provides its users with black and white imaging capabilities with a hardwired probe. It comes equipped with a compact design that allows it to be used in a variety of clinical settings and applications. 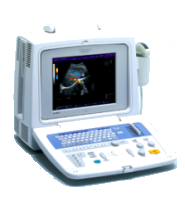 The UF-5800A by Fakuda Denshi is a portable ultrasound system that provides its users with high quality images. These images have both clear and precise gradation. This system has a folding design that allows you to protect the display and the controls when you transport it. 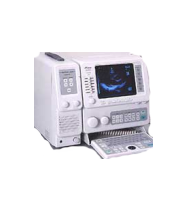 This ultrasound system is very useful because it is compatible with a variety of probes and clinical applications.